Steve Jobs, like an immortal, steps back into the screen. This technology icon of the century, with a Zen-approach to management, gave luster to the world of technology with his never-to-be-forgotten accomplishments. Every time a techno screen plays music, or an iPad takes pictures, or a film attempts to disclose his sphinx-like character, his undiminished persona is there. His life has made such an impact in the world as to be regarded as the the immortal who returns to step back into the scene of life. He so formidably mastered the ability to see far enough into the future as to produce his illustrious products that the world embraces with deep obsession. That is immortality. Jobs, the man who had the capacity to capture his own zeal and the passion of others, was a conundrum. Much of the media has tried to capitalize on his human deficiencies and has gotten ensnared by pointing out his character flaws. According to certain reports, Jobs was such a master at keeping his anxieties of the present minimized that, despite the voices that shouted from the rooftops about his temper, his ruthlessness, his business deceitful tactics, or inconsiderate manner, the media cannot topple down this tower of strength. As one of history’s greatest renovators, he did not need to defend his frailties. This adopted child, high school drop-out, relentless technophiliac, sinister enigmatic character, will forever be either hated or loved by all who came to know him. He will live-on forever, regardless. But Steve Jobs, like an immortal, steps back into the screen. Two movies have already tried to portray him. The new documentary film, Steve Jobs: The Man in the Machine, produced by Alex Gibney based on the screenplay written by Oscar-winning dynamo Aaron Sorkin, already has people questioning why we need another movie about the visionary Apple co-founder. Gibney’s film, another attempt to portray a complex individual such as Steve, is scheduled to premier October 9 of this year. Video bellow – a trailer for the documentary film starring Michael Fassbender. Jobs extraordinary ability to mesmerize the world with his products qualifies him as one of the financial monarchs of the world. By scrutinizing the strong business abilities of this so called sinister non-religious whisperer, he comes into view as an individual who knew his stuff. According to The Daily Beast, this icon known for wearing black turtlenecks, said: “an endlessly alluring megalomaniac who terrorizes the people closest to him and games the system to pad his—and his company’s— bottom line.” Well, does this not describe an entrepreneurial nerd who followed the advice of Pirzig’s Zen And the Art of Motorcycle Maintenance? Steve Jobs, the tech wizard who mastered his craft, will never be known as a saint, but, guaranteed, every religion in the world would canonize this super-technology icon of the century, if they could. Those who new him well experienced one man, the ruthless business man. The public, as demonstrated by the out-pour of veneration after his death, emotionally and spiritually connected intensely to his Zen charisma. This man was enigmatic to consumers and powerful in his field of business, creating a dramatically polarized personality that shall live forever in the history of technology. This techno geek with scientific gusto, powerful artistic design, and unprecedented Zen spirit of self, created not only a technological immortal product but performed on the stage of life as a master. His world renown feats qualify him as the unforgettable Steve Jobs, who like an immortal Zen master, steps back into the screen. The documentary film Steve Jobs: The Man in the Machine attempts to recapture the mysterious character of a man who haunts the minds of those who knew him best and the hearts of those who loved him. 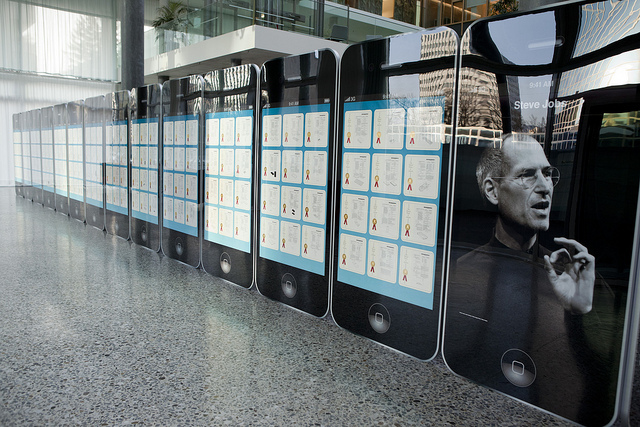 LA Times: Why do we Idolize Steve Jobs? One Response to "Steve Jobs Like an Immortal Steps Back Into the Screen [Video]"
Steve jobs like an immortal steps back into the screen video that’s quite amusing title.